This is the story of a girl (if a woman of 40 can still be called a girl, and I think she can) and her dog. Not just any dog, but a snuggly furball of craziness in the form of a rescued "pocket pit" (aka a small pit bull mix). Read about our exciting (and mostly, not so exciting) adventures as we make our way through the mean streets of Chicago. Really, if you're looking for some (fairly) entertaining writing and some (unbelievably) cute dog pics, you've come to the right place. 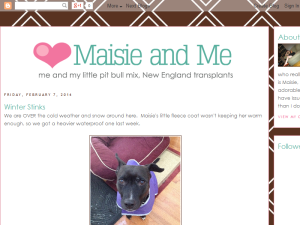 This what your Maisie and Me Blog Ad will look like to visitors! Of course you will want to use keywords and ad targeting to get the most out of your ad campaign! So purchase an ad space today before there all gone! If you are the owner of Maisie and Me, or someone who enjoys this blog why not upgrade it to a Featured Listing or Permanent Listing?